Aside from the brilliant The Cabin in the Woods and a couple of other exceptions, recent filmed horror has been long on cheap scares and gratuitous violence and short on substance and new ideas. 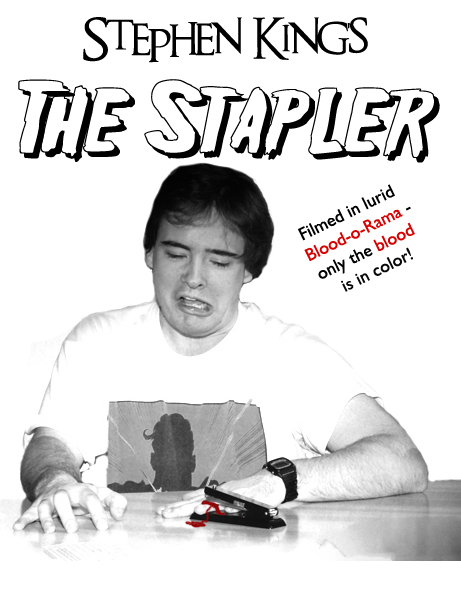 Imagine a satirical film shot in black and white except for the blood, which would show up as a garish Technicolor red. Every act of violence would suddenly stand out in stark relief, especially if the murders were doled out with some restraint - probably a lot to ask from modern filmmakers. Aye, there's the rub: this gimmick could all too easily be used to ramp up the exploitation factor of an already blood-saturated marketplace. I can just imagine directors going hog wild, massacring scores of victims in Blood-o-Rama just for the sake of cheap new thrills. Quite a spectacle. Naturally I'm not opposed to cheap thrills and gratuitous violence at the movies as long as there's some point to it all. Spielberg famously used a variation of this technique to powerful effect in Schindler's List, but of course his use of spot colour was tasteful and tragic rather than lurid and exploitative. I have a feeling that Blood-o-Rama, should some producer ever use it, will be used more in the vein of William Castle's favourite gimmicks, Percepto and Emergo and the like. If I may damn my own concept with faint praise, I'd at least sooner see a film in Blood-o-Rama than I would in 3D. May that particular fad die another quick death!